Insect pollination is essential to many vegetable and fruit crops, including tomatoes, squash, pumpkins, watermelons, blueberries, blackberries, apples, almonds, and many others. In the case of watermelons, there will be no fruit without pollination. Some vegetables don't require pollination to set fruit, but pollination by bees will result in larger and more abundant fruits. Nearly 75% of the flowering plants on Earth rely on pollinators to set seed or fruit, as well as one-third of our food crops, and most pollination is performed by honey bees, native bees, and other insects. Try our Beneficial Insects Attractant Mix. See all of our varieties that are good for attracting beneficial insects. Yet pollinators are at risk throughout North America. Beekeepers are losing commercial honeybees to colony collapse disorder. Several species of bumblebees are nearly extinct and many others are suffering severe declines. Other pollinating insects are similarly suffering from reduced habitat. As farmers and gardeners, we are in a position to provide food and habitat for native pollinators. We have the land, tools, and know-how to create insectary plantings and wild areas where pollinators can take refuge. They, in turn, will provide more abundant food for us, and those same plantings will attract other beneficial insects for improved pest management. Here are some guidelines for the kinds of plantings that will attract and nurture native pollinators, provided by the Xerces Society for Invertebrate Conservation. Large natural areas with plenty of flowering plants should be located within a half-mile of vegetable crops, because that's the longest distance native pollinators will fly in search of food. In the absence of natural areas, you can plant a "bee pasture" with red clover to attract bumblebees. Long, narrow strips along field edges or waterways, for example can be planted with flowering plants to attract pollinators even closer to crops. Additional small plantings of flowers should be created throughout the gardens to bring the tiniest pollinators into close proximity with crops. Plant numerous varieties of flowering plants that will bloom over the longest period possible to keep pollinators fed before and after the target crop blooms. Choose plants that are native to your area first, but don't be afraid to add non-natives to the mix. Many herbs and cut flowers provide food and habitat for pollinators. The best varieties produce a lot of pollen (Autumn Beauty sunflower is a better choice than a pollen-less cultivar such as Pro Cut) and have single petals (Sensation Cosmos, for example, is better than the fluffy double petals of Double Click Cosmos). In addition to plants, you can also provide nesting sites by leaving some untidy areas such as brush piles and old tree stumps. The Xerces Society has numerous fact sheets about landscaping for pollinators, and has just published an excellent book, Attracting Native Pollinators, that covers pollination biology, identification, and conservation strategies. When you're new to farming, everything is so interesting and exciting that you may assume you'll remember every detail of what you are growing, where and when you planted it, and how well it performed. Veteran growers, however, know that the details start to fade quickly over the course of a busy season. That's why the most experienced and successful farmers keep careful records. Record keeping may seem like an unpleasant task at first, and some people have to force themselves to make time for it. But a sensible record keeping system does not need to be a burden and, in fact, can give you some much-needed time for rest and reflection throughout your day. The very act of keeping track of your activities gives you a better perspective on your work. Systems run the gamut from a pencil and notebook to sophisticated online programs. Here are some ideas to get you started in developing the records that are most useful to you. 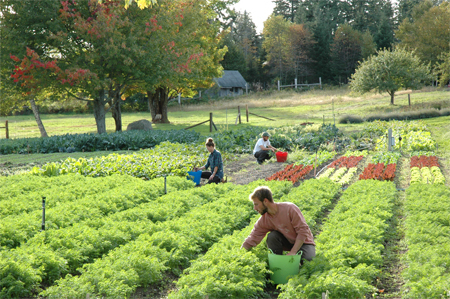 For certified-organic growers, there's a new online system called COG-Pro. It's designed to keep the records and produce the reports required by organic certification agencies. It also can be used by non-organic growers to track seed and plant purchases, and keep activity records such as fertilization and weeding. COG-Pro has the look of a spiral notebook, so it's easy and intuitive to navigate. And because it's a Web-based program, records are accessible from anywhere (you can even let your certifier look at your records remotely) and you don't have to worry about losing them to a computer crash, windstorm, spilled cup of coffee, or other on-site problems. The cost is $60 per year. Ag Squared is another Web-based system that is still being tested but is expected to be released this year. It will have multiple features that will allow you to create a farm plan, schedule tasks such as planting dates, record activities, track inventory, and track harvests and sales. In the works: a mobile app that will let you input information from your phone. The program will be free initially. While those systems are helpful because they prompt you to enter the types of information that many growers find valuable, anyone can create their own record keeping system with a spreadsheet program such as Excel or Numbers. And you don't have to be a spreadsheet expert to create something meaningful. The simplest spreadsheets are simply lists that can be sorted in helpful ways. For example, you might create a spreadsheet that lists every variety of seed you purchased this year, where you bought it, and the amount you purchased. You can then sort your list by crop name so you have, say, all your tomato varieties listed together. 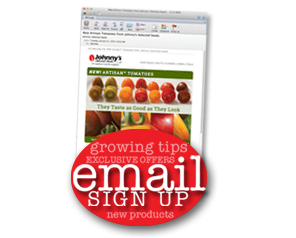 You might also want to sort by seed company name next year when it's time to reorder seeds. Even more helpful, you can add fields showing when the seed should be started, when the plants are transplanted, when the harvest begins and ends, yield, and any comments. Graduating into slightly more complex spreadsheet use, you can set up a planning spreadsheet that uses formulas to schedule planting or harvest dates. 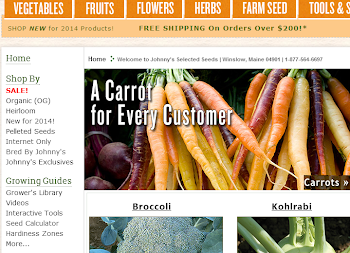 Johnny's has several of these in the Grower's Library to help you get started. If you're not conversant with spreadsheets, here's a tip: Click on a field and then look in the formula bar at the top of the table; if a formula was used, you will see it displayed there. That will give you some insight into how to set up formulas. Learning how to use spreadsheets is an admirable goal for the off-season. The more adept you become, the more sophisticated your record keeping will be. For financial records, many growers use the accounting program Quick Books. Make every product or variety you grow its own "Item" in QuickBooks. Once your products are entered as Items, be sure to use the Item names when creating an invoice or recording a bank deposit. If you're conscientious, you'll be able to tell at a glance how much money you made from every crop. Finally, if you're not comfortable using a computer, you can still keep excellent, useful records on paper. Get a three-ring binder and fill it with paper, dividers and tabs to make a section for every crop you grow. Then write down everything you do every day, crop by crop. Start with your seed purchase, the source and quantity, the date you planted the seed and transplanted the plants. Note the date and time spent weeding, irrigating, fertilizing, controlling pests, covering with row cover, and so on. Write down your first harvest, record the weights or units of each harvest, and note the date of the final harvest. This information won't be as easy to analyze as a spreadsheet, but it will still help you make adjustments to your farm planning in the future. Whatever system you choose, keeping good records will make you a better grower this year and in the future. For most food and flower crops, drip irrigation is the preferred method of watering. Drip irrigation conserves water by delivering it directly to the plants' roots, avoiding loss to wind and evaporation. It prevents water spotting on flowers and plants, which can make cut flowers unsalable and may even make customers think there's pesticide residue on your products. It also reduces the spread of disease compared to overhead irrigation. Drip irrigation may take longer to set up than sprinklers, but it can be automated with timers for consistent watering throughout the season. If you have never used drip irrigation, we recommend you try our system.